A delightful circular walk from Grassington in the Yorkshire Dales. The walk passes through the market square in Grassington and then slowly gains height as it follows the Dales Way. After passing through some limestone pavements the walk passes through Grass Wood nature reserve, before dropping down to the River Wharfe, which is followed back into Grassington via Ghaistrill's Strid. Parking: In the National Park pay and display car park in Grassington on the B6265 (grid reference SE 002 637). Leave the car park and turn left back towards the centre of Grassington. Shortly after passing Grassington Primary School, turn right up the cobbled, shop and café lined Main Street and proceed upwards through the market square. Keep on the Main Street up the left-hand side of the market square until the Devonshire Institute is reached - the building with the large white clock face. Here, turn left along Chapel Street and proceed along this for a couple of hundred yards to Town End. The old footpath used to proceed through the farm, but this was diverted in October 2000. Just before reaching the farm, turn right up Bank Lane, following the brown Dalesway footpath sign for "Kettlewell 5½ miles and Grass Wood Lane 1¾ miles". The lane quickly climbs, then flattens affording views of Bastow and Grass Wood ahead in the distance. After a further one hundred yards down this walled lane, where the lane itself bends around to the right, go left through a metal gate following the footpath sign for "Dalesway - Kettlewell 5¼ miles and Grass Wood Lane 1½ miles". The path heads across a field for a small gap in the wall about one hundred yards away, next to which there is another footpath sign. Go over the two-stepped stile through the gap in the wall, and head left through the narrow walled field for about twenty yards before turning right following again the footpath sign through another gap in a wall and down two stone steps into another field. About thirty yards from the wall, there is another Dalesway footpath sign for Kettlewell, follow this and head up across the field. At the top of the field, pass through the very narrow gap in the wall, again following the Dalesway footpath to Kettlewell sign. Upon leaving the wall, head around the right-hand side of the field about twenty yards in from the wall. Follow the wall around to the left as he top corner of the field is reached, and as a wall comes in from the right-hand side pass through a gap in the wall (about a yard wide) where stones are underfoot embedded in the grass. Turn left through this and immediately pass through another gap in the wall. Turn right and thirty yards further pass over the stone stile built in to the wall. Leaving the wall, the path splits and is now more obvious. Take the left-hand fork and follow the grassy path as it bends around to the left heading over towards the trees. Here, limestone pavements, a common feature of the Dales, can be seen on the way to the woods. There is also now an excellent view back down into Grassington and to Cracoe Fell beyond. Keep to the right of the limestone pavement and then pull in to the wall, which encircles Bastow Wood. The path slowly climbs, and upon reaching the second main area of limestone pavement, it diverts about thirty yards to the right and rejoins the more major path which was split from about a third of a mile earlier, and almost immediately pass the entrance to a small pot hole. Ahead now are the stepped embankments, on which there used to be ancient settlements consisting of hut circles and field systems. The path continues ahead, slowly drifting back towards the wall. With the stepped hillside about four hundred yards ahead, pass over the wall via a wooden stile on the left. Once over the stile, head away from the wall where the path climbs steeply for a few yards, between two mounds before levelling. The yard wide grassy path continues on in the same direction heading towards the trees. It then starts to slowly descend winding its way through the trees as it becomes a little rockier underfoot. After a few minutes walking a wall is reached which is scaled by a wooden stile. Climb over the stile and enter into Grass Wood Nature Reserve. This is a nature reserve run by the Yorkshire Wildlife Trust. "Grass Wood is an ancient ash woodland over limestone scars. It is one of the very few sizeable mainly broad-leaved woods in Wharfedale. This makes it particularly important for a range of woodland birds when nesting times comes around. From March to June the wood is alive with birds nesting and raising their young. Resident birds range from the secretive woodcock through the familiar chaffinch to the exotic looking green woodpecker. Green Grass Wood is also the home base for a number of returning migratory birds such as pied, spotted flycatchers and wood and willow warblers. During the nesting season please ensure that you and any dogs keep to the paths through the reserve. Follow the now much wider track downhill to a T-junction, ignore the track off to the right on a left-hand bend. Turn right at the T-junction following the footpath sign for "Grass Wood Lane". Follow this wide track downhill through the trees, where about two hundred yards after a sharp left-hand bend, a road is reached (Grass Wood Lane). Go over the small wooden stile and turn left along the lane. After about six hundred yards as the road is rising, pass through the wooden kissing gate on the right into Lower Grass Wood, and follow either of the two paths down to the riverside. There is also a footpath sign here for "Grassington 1½ mile". 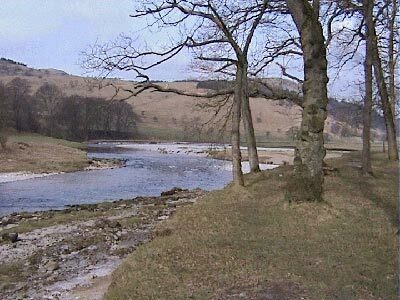 Upon reaching the river Wharfe, follow the path to the left, heading downstream back towards Grassington. The path at one point climbs a little away from the river bank, where upon reaching a large boulder take the right-hand fork in the path back to the river bank. Pass over a wooden stile on exiting Lower Grass Wood and continue downstream for a further few hundred yards. Here as the river bends around to the left, there is a well-placed seat that affords views down to Ghaistrill's Strid, opposite two houses on the far bank. From the bench, continue towards Grassington, passing over a wooden stile, along a short enclosed path, and then over two stone stiles in short succession. Follow the path along the side of he river heading for the 17th century bridge. Upon reaching the bridge turn left back up on to the road into Grassington, and follow it back around the final half a mile to the car park.